Can't login with your Skype app suddenly?and had notice a Skype Disk I/O error warning? 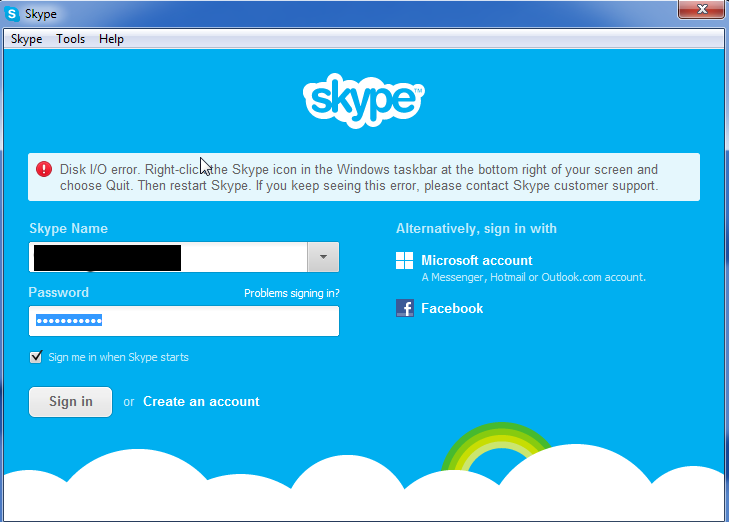 Don't panic.This error is a very common one in Skype, just follow the tips below on how to fix it easily. First make sure to install a new version of Skype.Open your skype go to > Help > Check for updates.Just follow the process. Go to Windows Start and in the Search/Run box type %temp%\skype and then press Enter or click the OK button. Delete the DbTemp folder. Terminate the skype app.In your the run menu type in : %appdata% then, hit enter. Rename Skype to Skypeold. Restart Skype and see if the problem is resolved. If you have McAfee / Norton Antivirus installed in your system try to enabling / disabling its Firewall feature.Sometimes the firewall block Skype connections or any other program unnoticed. I hope these options will work for you.